Polk Audio's 265-LS may be part of their Vanishing series, but one listen and you'll know this in-wall speaker is no "wall flower." The 265-LS offers stellar sound in an inconspicuous design that hides in your wall. Whether you're using this speaker as the basis for a stealth home theater, or a pair for stereo listening, its performance rivals that of Polk's flagship LSi M series traditional loudspeakers. In fact, you can put together a system mixing this in-wall speaker with free-standing LSi M floor-standing or bookshelf models - whatever suits your room and your decorating sense best. The 265-LS begins with dual 6-1/2" Dynamic Balance drivers, which deliver clear, accurate mids and dynamic lows. Polk's PowerPort® bass venting system reinforces the bottom end for clean, punchy bass. The 265-LS uses Polk's own advanced version of the classic "ring radiator" tweeter for smooth, detailed highs. Polk's Vanishing® Series 700-LS in-ceiling speaker is designed to stay out of sight and out of mind...until you hear the rich, detailed sound it produces. This high-performance speaker hides away in your ceiling, which means you can enjoy great sound in rooms where regular free-standing speakers are an awkward fit. The secret to the 700-LS's compact cutout size lies in Polk's innovative "Cassini Oval" driver design, which positions an oval-shaped woofer at an angle behind the midrange and tweeter array, in a built-in dual-ported bandpass enclosure. 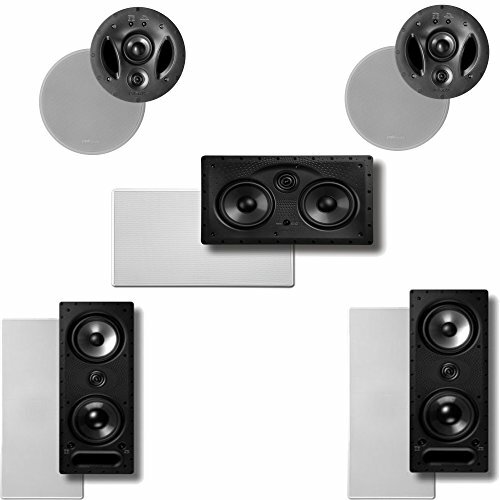 The center channel speaker is critical in any home theater system, yet it can be the hardest to place. Do you put it below the TV, or get a shelf for it, or what? The in-wall Polk 255c-LS is a great solution. This in-wall center channel speaker is built to perform. Potent 5-1/4" woofers work with Polk's PowerPort® bass venting technology to deliver punchy lows.